Professor Roger Farmer’s new book, Prosperity for All: How to Prevent Financial Crises, was published this month by Oxford University Press. Learn more about the book on his website. 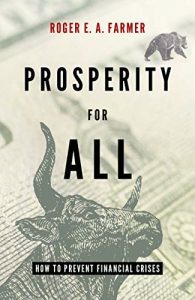 In my book Prosperity for All: How to Prevent Financial Crises,I draw on evidence not just from the 1930s, but also from later decades, to build a theory that accounts not just for depressions, but also for stagflation. Unlike Keynes, I do not conclude that more government spending is the right way to cure a depression. Instead, I argue for a new policy in which central banks and national treasuries systematically intervene in financial markets to prevent the swings in asset prices that have such debilitating effects on all of our lives.